Paul Hunter bowed out of the UK Championship after a 9-2 third-round defeat to Chinese star Ding Junhui. The world number five, who is battling against cancer, resumed 7-1 down to the teenager on Monday but could only win one frame as Ding sealed victory. "It's tough at the moment but I'll keep going to tournaments and keep trying. "I'm disappointed to have got beaten and that I've got cancer, but happy that I won a match here and that I've got a baby coming soon," he said. Hunter's chemotherapy will continue until the end of February and it will be six months after that before he can expect to have regained full health. "The doctors say you have to try to live your life as normally as possible but it's difficult when you are having chemo," said the 27-year-old. "You get tired very easily, although I'm not having as much sickness now as I did in the summer. "I just wanted to play something like I could here but I didn't. You need a clear mind to play snooker and I haven't got that at the moment but I still kept fighting. "It's frustrating when you know what you can do and you can't keep still on a shot. "It was such hard work yesterday and I felt like I had someone else's arms. At 7-1 down you are just waiting to be beaten." Hunter's wife Lindsey is due to give birth on 27 December and the Leeds player is focusing on the imminent arrival. "I'm looking forward to the 27th and hopefully my son or daughter can inspire me to play well next year, he added. Ding, who won last season's China Open as an amateur, will next face world champion Shaun Murphy or rising Australian star Neil Robertson. John Higgins had been installed as the favourite for the title after Ronnie O'Sullivan's exit but was no match for a rejuvenated Ken Doherty. Doherty began the match with a 107 break and added two further centuries and took three consecutive frames from 6-6 with some flawless potting. 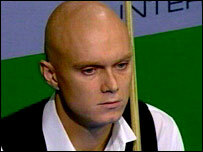 "That's the best I've played since losing the World Championship final in 2003," said the Irishman. "I've had a very frustrating time because I don't feel any different from then apart from my confidence levels. For some reason that final knocked the stuffing out of me and it has taken a long time to get back. Higgins admitted there was nothing he could do to stop the Irishman. "I didn't do a lot wrong and ultimately you have to realise it's just a game, especially when you see guys battling with cancer," he said. Stuart Bingham routed his practice partner Mark Davis 9-2 and will play either Mark King or Joe Perry in the quarter-finals while Allister Carter edged Peter Ebdon 9-7. Two unfinished matches saw Stephen Hendry open a 6-2 lead over Mark Williams and Stephen Maguire take a 5-3 advantage over Steve Davis.